Maintain buy with an unchanged target price (TP) of RM4.25: Following the analyst briefing, we remain optimistic about Cahya Mata Sarawak Bhd’s (CMS) long-term outlook, backed by the resilient earnings contribution from core businesses and a higher profit contribution from associates, despite weak construction sentiment post the 14th general election. The cement division is expected to continue suffering from increasing clinker prices while the material and trading division is also facing margin compression as a result of higher prices of bitumen and diesel. Nevertheless, we are excited about the latest expansion updates from the strategic investment as well as the recently announced Sarawak’s Budget 2019 in which RM9.1 billion was proposed to finance various initiative programmes and projects in the state. All in, we have maintained our “buy” call, with an unchanged TP of RM4.25. 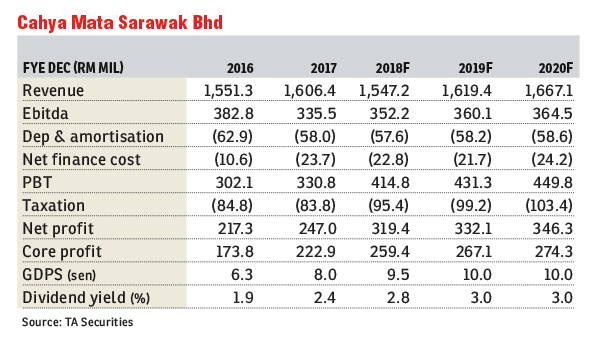 The key reason for the robust performance in the first nine months of financial year 2018 was mainly due to higher profit contributions from associates, especially from OM Materials Sarawak and Sacofa. Management is cautious about the outlook for OM Materials Sarawak as manganese operations are making a small loss currently as a result of lower average selling prices and higher raw material cost. Meanwhile, OM Materials Sarawak is planning to expand its production capacity by setting up an additional six furnaces. According to management, the expansion plan could be funded by equity financing via the public listing of Malaysian Phosphate Additives (MPA) in Sarawak. The group has increased its stake from 40% to 60% in which MPA now has become the subsidiary of the group. The group has already started to build the new plant in the Samalaju Industrial Park in Sarawak with an expected completion date by mid-2020. 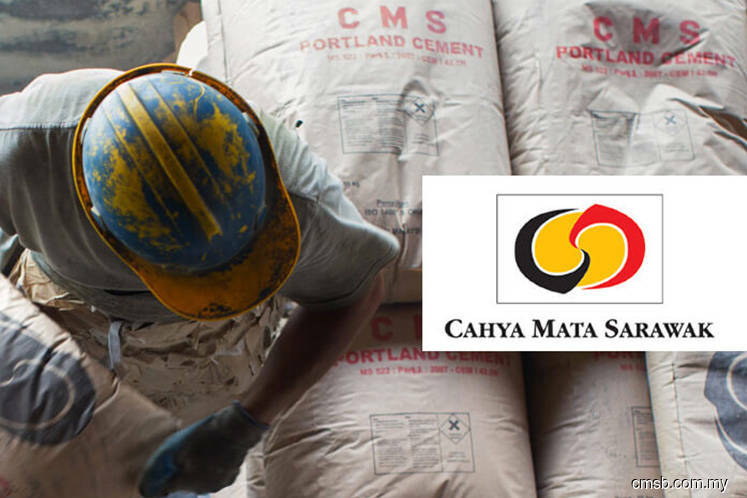 Unlike cement players in Peninsular Malaysia that are facing a stiff price war and overcapacity issues, CMS is the only domestic player that can generate healthy profit from the cement business currently as it is the sole cement supplier in Sarawak. However, the group is still suffering from increasing clinker prices due to reduction clinker production in China amid high demand from Bangladesh and the Philippines. Based on management guidance, the clinker price has surged at least 20% year-on-year and the group has to import about 50% of clinkers for its cement production. One the other hand, the group saw margin compression on the construction material and trading division due to increasing prices of bitumen and diesel, together with lower production as a result of a shortage of quarry. The group recently acquired a 56% stake in Borneo Granite Sdn Bhd for RM31 million in order to resolve the issue of a shortage of stone supply in the Pan Borneo Highway project as it requires a large quantity of granite stone for its pre-mix wearing course. The newly acquired quarry occupies about 139ha of land with two hill reserves, which have an annual production of one million tonnes of granite stone. We are positive on the acquisition as it helps the group expand its granite stone’s annual production capacity to 1.5 million, which can resolve the present shortage of stone immediately. This article first appeared in The Edge Financial Daily, on Dec 3, 2018.